Navigate to vendor dashboard. Click on Products from the left menu and then Add New Products button from the top right corner. It will open a new window where you will be able to create a new product very easily with providing the most important details only. The common information about a product are the title, price, description. Discount price is optional. You can even schedule discounts for a certain amount of time. You can enter a starting date and end date to apply automatic discounts to your product. Both the categories and tags have to be created by the admin. The vendor can only select them from the frontend dashboard. Because allowing the vendors to create categories might Select Category. By default, category selection is singular. That is why there is a drop-down field to select a category. This should be the standard setting. Because according to Google Webmaster Guidelines and other SEO and UX best practices, it is recommended to have only one category assigned to a product. 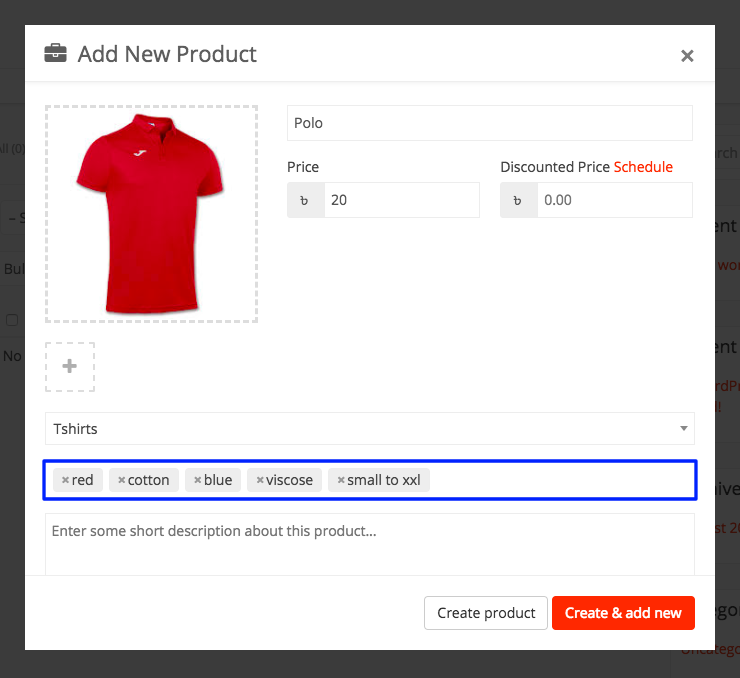 If you need to show your products based on multiple factors or for searching or sorting feature, you can use tags. Vendors need to select the category from the drop-down. If you really need multiple categories in a single product, just select from the dropdown and add multiple categories. vendors will be able to create new product tags from vendor dashboard. Previously, vendors were only able to use the tags predefined by Admins. Vendors click on Vendor Dashboard>Product>Add New Product. Under the Select Product Tags field, add a tag and Press Enter. The word or phrase will be added as a separate tag. After you have provided all the required information, Click on the Create product button. It will create the product and redirect you to the product edit page, where you will be able to add more information about your product. If you want to create the product and add another one immediately, click on the Create & add newbutton. After you have been redirected to the product edit page, there is an option to select a product type. You can select either a Simple or Variable product. These types of products are simple and have no variants. They are single and standalone products, which does not require any other information to define different variants. A variable product is a product that has different types of variants. For example, you might want to sell a dress which is available in 3 different colors and sizes. So this option will enable you to add those colors and sizes you need. You can add variations based on anything you like, perhaps material used or the stitching style. To create a variation from the frontend, the vendor has to select This Product Has Multiple Options. Then some new fields will appear to input the variations. If you already created some variations from the backend, then you can select them from the dropdown on the top right and click Add Option. If you do not need all the attributes in your product, then you can remove or add more if you want. Now if you need custom variations and attributes of your own, then you have to select Custom Attributes and then click Add Option. Then two blank fields will appear to input the variation name and attributes. You can add as many variations and attributes as you want. When you are done, check the box Create variation using those attributes. The system will make all the combinations and will prompt you to add prices for those variations. If you want to disable any variation, then you can uncheck the box on the left. Quantity and variation picture adding function will not be available right away. You have to save the product once to get those options. Right after saving the product, the fields above will have a pencil icon on the right. Click on that to add more details to the variations. To learn about the grouped product go through this tutorial. This section holds a bit of complicated information. None of these fields are mandatory. If you do not need to add stock quantity and your is just a simple product, then you can totally skip this section. But if you are creating a downloadable product or selling a dress or t-shirt, which has multiple sizes, then you should read this section carefully. SKU stands for Stock Keeping Unit. It should be a unique set of characters which will not match to any other product. Let’s say you have 10 pieces of the product and you don’t want to receive after orders are placed for 10 units. If you enable stock management and enter 10 in the quantity field, then after 10 units are ordered, this product will show a message that all the quantities are sold and there is no stock. But, you might want to take some pre-orders before your next batch comes up. So you can Allow Back Order to let the customers place orders even if the product is out of stock. If you are selling photos, music, software or any digital product, then this is the option to use. If you click on the Add File button, three more fields will be added. The name field defines what the downloaded file name should be. We are letting you define that because you might name the original file to something like “new-album-updated-jan-12.zip” and you want the user to download the file as “New Album”. So this option will be useful for you to serve and organize better. If you are serving the files from your very own site, then you can click on choose file and select. But you can also serve the file from Dropbox, Google Drive or some other file hosting site you like. Visibility: The visibility option defines the privacy of the product. By default “Catalog and Search” is selected. But if you want the product to only appear on category listing page, search results or want to list as a hidden product, then you can select the option respectively. If you select any other option than Catalog and Search then the product will not appear on the site other than the store page. Purchase Note: If you want the customer to receive a custom message right after purchasing the product, you can paste that in the box. Reviews: If the vendor does not want to receive reviews for the product from the customers, he can turn it on or off.